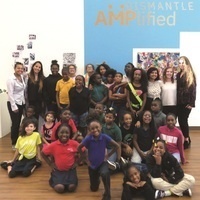 The Artist Mentorship Program (AMP) is an outreach art program of the University Galleries, FAU Museum Education Program, partnering with the Boys & Girls Clubs of Palm Beach County. FAU art students and alumni teach visual arts classes to youth ages 8 to 17. The AMPlified exhibitions showcase the student works made throughout the course of the programs Spring and Fall semesters. Made possible through funding by the Community Foundation for Palm Beach and Martin Counties.